Every January, the Nagano JET email list gets bombarded with talk about the craziest thing you’ll see in Japan- the Dosojin Fire Festival. Promises of snow, sake, and fire entice lots of Japanese and foreigners to the quaint ski village of Nozawa Onsen. This year was my third time to witness the annual event. I got a lift up to Nozawa with some other JETs. We could see fireworks while we crept along the snowy roads, so we missed the beginning of the festivities. Once we reached Nozawa, the festival was easy to find as an old woman welcomed us with paper cups of sake. Along the walkway to the festival grounds tents sold the usual snacks like squid on a stick and okonimiyaki. I got a refill of warm sake just before heading into crowd. The main area was full of spectators braving the cold. A high wooden shrine stood down the path from a big bonfire. On top of the shrine the 42 year old men of the village sat clapping and chanting. Below them, the 25 year old village men sang and swayed. 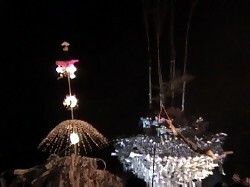 Two tall poles with lanterns and streamers filled with kanji were situated amongst the onlookers on either side of the wooden structure. 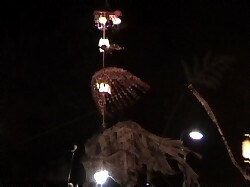 The kanji streamers on the lantern pole blow in the wind. 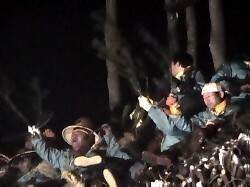 The 42 year old men on top of the shrine wave pine branches. We arrived just in time to see the start of the fighting. 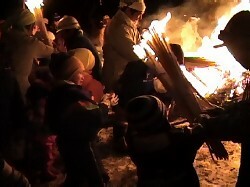 Fathers took their young sons to make little torches from the bonfire. They charged down the path to try to light the shrine on fire. 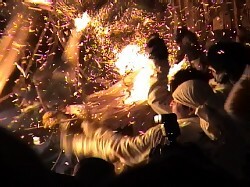 The 25 year olds guarded the shrine from being lit; however, at this point, the fighting was calm and ceremonial. As I was filming and chatting with friends, I spotted a sake man across the aisle. The sake men walk about the festival with a big bottle of sake and a cup attached to a string around their necks. The one I spied was eager to practice his English, albeit slurred, as he poured me and my friends more sake. 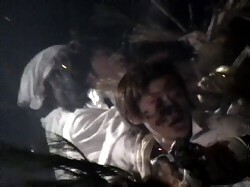 When I pushed my way to the front of the crowd to continue filming, I ran into fellow Snow Japan members. There wasn’t much time to talk because the fighting was becoming increasingly violent and entertaining. 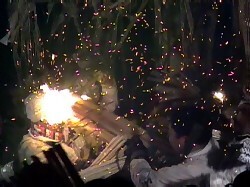 Sparks and embers sprayed everywhere as the 25 year olds thwarted the villagers’ attempts to ignite the shrine by swatting their torches with pine branches. 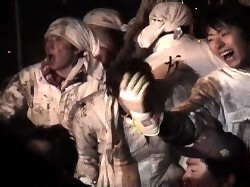 The faces of the 25 year olds were covered in soot after taking brutal hits during each wave of the attack. I think their inebriated state numbed them from the harsh beatings they received. One man seemed surprised to see blood after wiping his face. If they weren’t holding on to ropes attached to the shrine, they probably would have fallen over from their drunkenness. 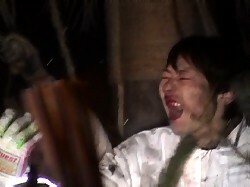 During the lulls, the 25 years olds, unconcerned about their injuries, sang and egged on the villagers. Meanwhile, the equally intoxicated 42 year olds waved pine branches and threw down bundles of sticks to encourage the battle. I alternated my time between watching the fight and chatting with the sake man. He took me under one of the lantern poles to the "crazy zone" as he called it. Here many drunk sake men tried to remain upright as they kept the drinks and slurred conversations flowing. One of them gave me a stick to use as a torch in the fight. It was a kind gesture, but in vain because neither women nor non-villagers are allowed to participate. As the fighting intensified, it was more fun to visit with friends than to watch the 25 year olds repeatedly get thrashed. Quite of few of the Nagano JETs were planning to ride at Nozawa in the following days. It had snowed all week, and Nozawa is a huge mountain with lots of sweet powder stashes and fun runs. It’s by far my favorite place to board so I was jealous of those who didn’t have to work the next day. Despite his bloody face, the 25 year old is still ready to fight. After about an hour of vicious attacks, the battle ended, and the 42 year old men descended from the top of the wooden structure. 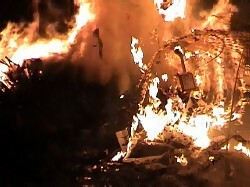 The shrine became engulfed in flames as an offering to the Gods. The intense heat from the fire caused the sake-high crowd to move back, and the strong wind scattered the embers all around them. Everyone patted each other down to avoid holes in their clothing. 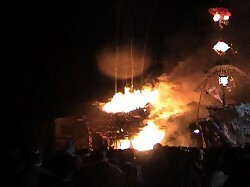 The lantern poles were added to the burning structure, creating a raging bonfire. I found the friends who gave me a ride and got a fresh okonomiyaki on our way out. As we drove away in the snow, I noticed that my hat had a burn mark on it. Not a bad souvenir from this crazy fire festival. The following is the official word on the Dosojin Fire Festival - information provided courtesy of Nozawa Onsen Village.